On The Bright Side is one of those truly rare books readers of all ages will cherish. Laura McCorkindale and her lovable Peanut People offer a unique blend of cheery inspiration and optimistic fun for the whole family. The Peanut People come to us from the future with their unique brand of juicy hope, joyous metamorphosis and the dream of a better World. 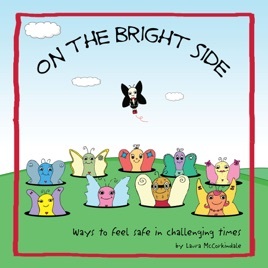 A delightful gift for kids or grown-ups, communities, schools or individuals, On The Bright Side is tailor-made for successfully navigating today's challenging waters of life, cheering up your friends or inspiring positive action that will make everything just a little bit better. "It's a beautiful book - and important to the world!" "I love this book. It's smart, spiritual and endearing. It's a brilliant idea and I wish it had been mine." "I was moved by the inspirational life lessons these awesome Peanut People resonate. On The Bright Side has a timeless and universal wisdom and I look forward to giving this as a gift to my friends and family of all ages."